Every successful business has the same problems: How to expand the range of products without taking unnecessary financial risks? How to balance order peaks without having to acquire permanent additional personnel or new machinery? The solution: contract manufacturing. We manufacture and package ointments, creams, lotions, gels, powders, medicinal herbs, liquids and bulk raw materials in almost any quantity you need. We can deliver the final product or a premix. 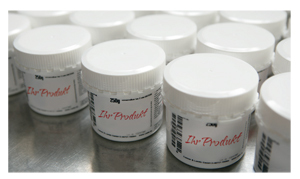 Unlike many other contract manufacturers, we are also happy to produce small scale quantities. These will be manufactured with the same quality requirements as large scale amounts. Production is carried out using only the most modern machinery, for example Becomix ointment processing systems and Groninger and Gepas filling machines. We have approximately 200 highly qualified employees in our factories in Hilden and Bonn, bringing to the table their collective experience and expertise in everything from acquisition to production, packaging and quality assurance. You save on investment/personnel costs and can flexibly balance order peaks. In short: you reduce expenses, not possibilities.